Great minds think alike. In my last post I wrote about the importance of some bloggers becoming the hub that connects others and today I am sharing these thoughts from Murray Newlands about how he can assist us with Blog Outreach. Murray has a major PR4 Affiliate Martketing Blog and also posts about email marketing and Social Media Marketing. Be sure to read my testimonial below his comments about what collaborating with Murray has done for me. Blog outreach involves communicating with bloggers to engage their audiences with your message. This could be as simple as getting them to review your product. Good product reviews on the right products will lead to more sales from the blog’s readers. Some blogs rank very well in search engines and will increase traffic search traffic. More links to your website will increase the search engine position of your site. If you are not leading conversation in your subject area someone else will be. If you are not leading the conversation about your company or product someone else will. Engagement with your audience will lead to useful feedback for your company. You should be building relationships with the blogging community before your competitors do. If you have read this far you know what you need to do now: contact Murray Newlands for Blog Outreach. 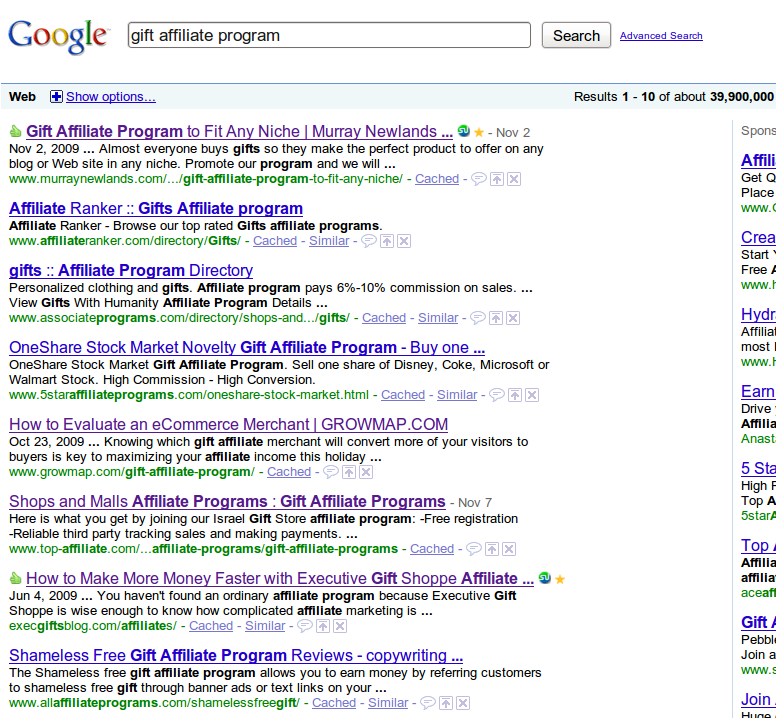 His post hit the first page of Google results in 48 minutes for my target phrase “gift affiliate program” (see MazeCore image) – his blog is indexed so quickly because he regularly publishes four posts a day. The guest post on his blog was third and my own related post here was fourth until recently. My own Best of GrowMap post is first at Google – and this is most likely because of his linking to it. Even though there is duplicate content his now appears on the second page. It originally was on the first page. Google Analytics shows that 25 of his readers visited my blog and read an average of two pages each. Some percentage of those visitors will become regular readers. I wish I had been using MazeCore to track key phrases so I could tell you how much difference those incoming links with anchor text may have made in my overall search engine placements. I have no doubt they will have a lasting effect on how findable my site is for those phrases. Murray’s post is first because his blog has a higher pagerank and is stronger than mine in the affiliate marketing niche which makes my guest post on HIS blog more authoritarian than the same post would be here. The GrowMap post shown fifth contains extensive links and resources for affiliate marketers so it should more attract incoming links over time that can help maintain a first page listing. The post shown seventh is one of several targeting that phrase that I have written for the ExecGiftsBlog gift affiliate program. It appears on the first page because the guest post on Murray’s blog and my posts link to it using gift affiliate program as the anchor text. If you have a business – even if you really don’t know what all this means – Murray can reach out to bloggers for you. He can raise visibility and sales for your products and services. Even if you don’t have time to figure any of this out yourself, even if you do not yet have a blog, don’t know any bloggers, and have no idea how to go about getting connected on Social Networking sites NOW is the time to take action. Business is changing and if you want to survive and prosper you must change. I can strongly recommend Murray as the person who can make sales happen for you. You don’t have to learn this yourself if you hire someone who knows what he is doing and has a system already in place – in fact, you would be better off using the existing connections Murray has. You will get faster, more consistent results that way. If you have followed all this so far you already understand what to do and how collaborating with Murray can benefit you. Bloggers can contact him about collaborating with other bloggers and his clients. If you do not have a clear idea what I am even writing about that is even more reason to contact Murray and collaborate with us and others because we can assist you in making this happen for YOUR most important keyword phrases and driving more targeted traffic to your site. If that is all too complicated then just do what you know how to do. Write a blog post and send it to Murray. I recommend we all write about each other at least once a month and regularly share each other’s content because that is what will be most beneficial overall. I guarantee that you will get more out of collaborating with Murray than you put in! Those who put a process in place will reap major benefits. Do you have a regular process, weekly link love post, or other method that has enabled you to consistently reward those whose content and activities deserve your attention and thanks? If you do please share it with us. BuildABetterBlog – (DeniseWakeman) – Blog Outreach: Are You Missing This Traffic Tactic? SocialMediaToday – (SocialMedia2Day) – What the Hell is Up with Technorati? That’s why I maintain my own blog: to get more hits and to get that high page rank everyone wants. Blogs are very important tools too if you want to promote your services and products. I is complete guide line how to bring traffic to your blog and the fastest way to index your blog in Google searches. There’s no doubt that blogging is a critical component of Web 2.0 SEO strategies. My San Diego real estate blog has been a great thing. I give the public important information about San Diego homes, mortgage, and the real estate market in general. In turn they recognize me as an expert in the field. It’s a win-win. True and it is going to get far more important. Those who become established experts in their niche can greatly improve their success online and off and assist each other. I highly recommend the best real estate and home improvement bloggers collaborate, link to and write about each other. I see our DoFollow CommentLuv KeywordLuv community and our private blog collaboration as being key to surviving in any economy. Do be sure you have your Local Search Directory Listings in every directory because those links are valuable and it allows potential clients to find you and happy clients to review you. I was thinking of starting something like this myself once I made my blog move. FYI – I’ve heard that one of the things Technorati changed recently is that recent link thing…no longer are they using that method. It is difficult to say what exactly Technorati is doing these days. They are still important but their site has never been very usable so most don’t realize how they could be benefiting from the data they collect. I am surprised they would let their widgets stop working for so long and apparently intend to replace them eventually which means every site displaying one will have to upgrade. You would think they could preserve all those links somehow. Exposing links to your web visitors is how the web works and is why Google loves them so much – they are like the superhighway of the web. I am a huge advocate of guest posting and helping other bloggers. In turn you are helping yourself. Writing for authoritative sites is a great way to bring value and content to that site and in turn send quality links back to you. I think you hit this principle pretty good here. BTW – I still owe you a guest post. Guess I’ll get on that now. I just wanted to thank you again for the excellent guest post. I have no doubt that with your writing skills there will be a huge demand for you as a guest blogger. For those who haven’t read it yet click on the CommentLuv featured post How Guest Blogging Can Change Your Life. I definitely use a blog for my business to increase search traffic. It seems that blogs immediately ranked high as fresh content for Google, and then they drop down, but if someone is searching for that specific topic, then they will go directly to my site! You can definitely drive targeted visitors from blogs to business and ecommerce sites. Search engines usually favor information sites over commercial sites and quality content is more likely to attract incoming links that will keep your content from dropping over time. We have noticed that Google is experimenting with having very fresh content on top followed by other content which causes positions to fluctuate more than they used to even on the same day.